Reasons to Sell Your Yacht With a Professional Yacht Broker : Atlantic Yacht & Ship, Inc.
Atlantic Yacht & Ship is always innovating our marketing strategies in order to stay on the forefront of technology and studying how it effects the sales of our yachts. One important aspect of a yacht broker marketing a pre-owned yacht for sale is the making of quality videos featuring the yachts. We have been producing our yacht videos in-house for a number of years now and we have become very creative with producing these videos and very effective in marketing them. With each video, we innovate in the subtle changes and highlights that make that video work with that particular yacht. A video is also a very effective tool in international yacht sales. This is because you can send a quality yacht video to a potential buyer overseas and he can get a good feel for the yacht before traveling. This is just one reason of many why we have become so successful with international yacht sales. 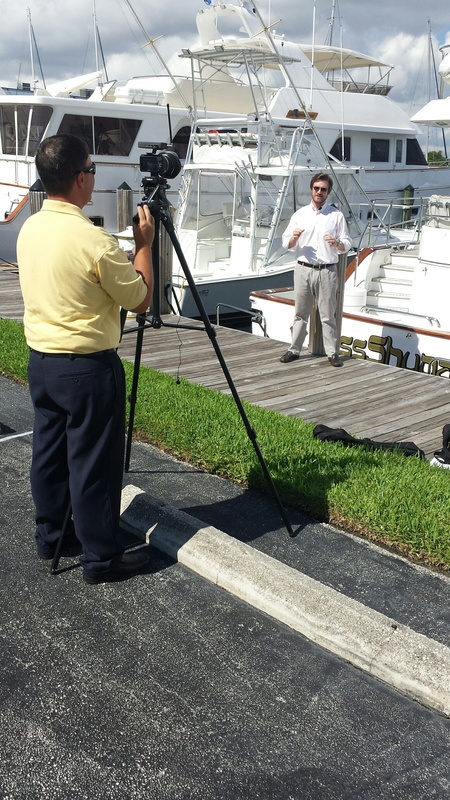 The other day Barrett, our multi-media guru, was down with Brent shooting a video on the newly listed yacht for sale. Of course videos are only one aspect in getting a yacht sold. Exposure to potential buyers is a key ingredient for successfully bringing buyers and sellers together. Atlantic Yacht & Ship features listings on the three major international yacht broker MLS sites, as well as several other internet sites, in order to get the listing maximum exposure. We also build a dedicated landing page on our website that features the full listing, as well as the video. This helps us ratchet up in Search Engine Optimization which ultimately effects our position and rank on search sites such as Google. One thing is for sure, if you list your pre-owned yacht for sale with Atlantic Yacht & Ship, you will be getting a full-circle yacht sale experience from a group of dedicated and experienced professionals. For over 53 years Atlantic Yacht & Ship has been serving the yachting community. Our headquarter sales office is dockside at Harbour Towne Marina in the heart of the yachting capital of the world, Fort Lauderdale, FL. Our in-house waterside service department provides general yacht services from new teak, to engine rebuilds, captain services, and everything in between. Whether purchasing or marketing a quality vessel, Atlantic Yacht and Ship, Inc. is your one stop resource for the highest quality service and sales in the yachting industry today. If you are looking at yachts for sale, or thinking about selling your yacht, it is always wise to have an experienced broker representing your interests throughout the deal. Contact Atlantic Yacht & Ship at 954.921.1500 or click here. This 60′ Viking yacht for sale needs to sell ASAP!